Staffordshire YFC are ready for the year ahead! Staffordshire County Federation of Young Farmers Clubs (SCFYFC) is about to join in a National celebration to shout about just what their organisation is all about! SCFYFC, who have been affiliated to the National Federation of Young Farmers Clubs (NFYFC) since 1952, has ten active clubs across the county, and had a total of 680 members aged between 10 – 26 years of age during the year 2017/18. As the Clubs started their new membership year on 1st September this year, many evenings joining up new and existing members as well as Club AGM’s have been held. All the evenings have been extremely well attended with many clubs have more than one member standing for positions of responsibility. As a democratic and membership led organisation, SCFYFC can offer young people living in and around rural communities of Staffordshire a host of opportunities and competitions to get involved in, all for the princely sum of around £45 per year! And don’t worry, you don’t have to be a farmer – in fact you don’t have to know anything about farming, all you need is a sense of adventure and a love of the countryside! Our members come from all walks of life including Receptionists, Hairdressers, Dog Groomers, IT Consultants, Students, Teachers, Chefs… the list is endless! Led by young people, for young people, SCFYFC provides anyone aged 10 to 26 with a fantastic chance to meet lifelong friends, learn new skills, make a real difference to the local community and even travel the world! During the year, Staffordshire YFC holds a varied Competitions Programme which can lead to Area and National Finals competing against fellow members across the county. Competitions on the calendar this year include Rugby, Football, Netball, Cookery, Darts, Fence Erecting, Floral Art, Raft Races plus many more. At the recent National Finals of the NFYFC Floral Art Competition, our winning senior member, Phillippa Bourne of Stone YFC took 3rd place in this highly competitive competition, which is a brilliant achievement. 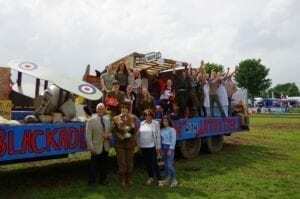 The highlight for many of the members in Staffordshire YFC, is the Annual Rally which is a day filled with over 40 competitions and the County Show where all clubs showcase themselves on a Show Float which is paraded in the main ring. There is also an exciting and unique YFC Travel programme, via the National Office, that includes homestays and working holidays – as well as a fun ski trip in January. Full support is given to any members wishing to apply for these opportunities. Training and learning opportunities also play an integral part of the YFC Calendar, with all clubs putting on evenings including Team Building, Good Communicators and Safe Driving. 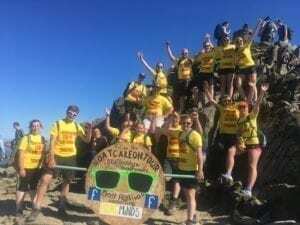 Staffordshire YFC have certainly packed a lot of community work and fundraising into the last 12 months, with clubs coming together to raise funds for Young Minds, the leading mental health charity for young people. At the County AGM in November, County Chairman Richard Mottershead will be presenting a cheque for over £7000 to Young Minds, which was raised with various sponsored activities and events including Stone YFC who climbed to the top of Snowdonia, carrying the giant Oatcake Baton which has been parading around the County as part of the charity fundraiser. Staffordshire YFC ten active clubs across the county are Abbotsholme YFC (Closed School Club); Ashley YFC, Chase YFC, Cheadle YFC, Eccleshall YFC, Leek YFC, Lichfield YFC, Stone YFC, Uttoxeter JNFU and Waterhouses YFC. Social media will be very active with all clubs this week as they celebrate #trueyfc during the National Young Farmers Week explaining just what YFC means to our members. For further details on joining one of the clubs, please do not hesitate to contact Julia Taylor on 01785 248645 or email countyoffice@staffsyoungfarmers.org.uk . The County Facebook page also has up to date information about forthcoming events across the clubs too.